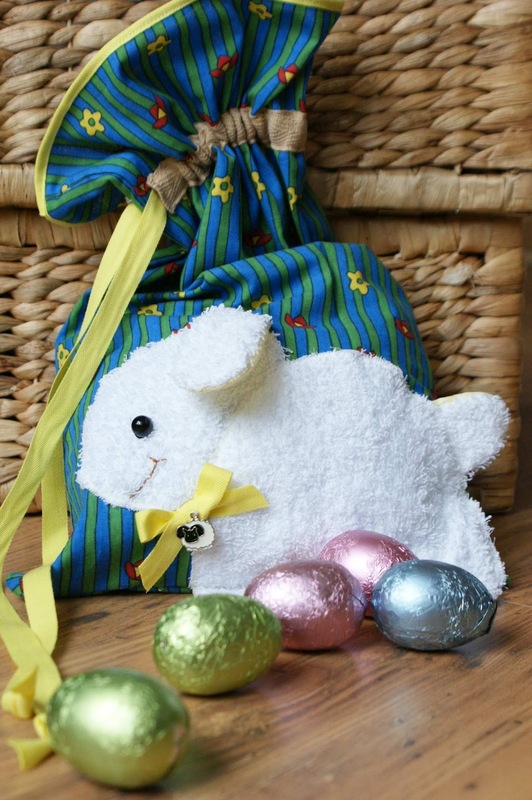 Easter is nearly here again. 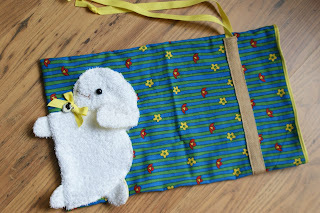 Last year I made an Easter bag (posted on my blog in April 2012). Originally it was intended for the Easter day egg hunt but we did not hide it in the cupboard after the Easter. It has been sitting on our kitchen shelve ever since, being used as a sweets' bag. You can find the instructions bellow as published last year. Further bellow you can find some materials that could be used to sew this bag and that you can purchase directly from my online shop. This year I wanted to make something new. 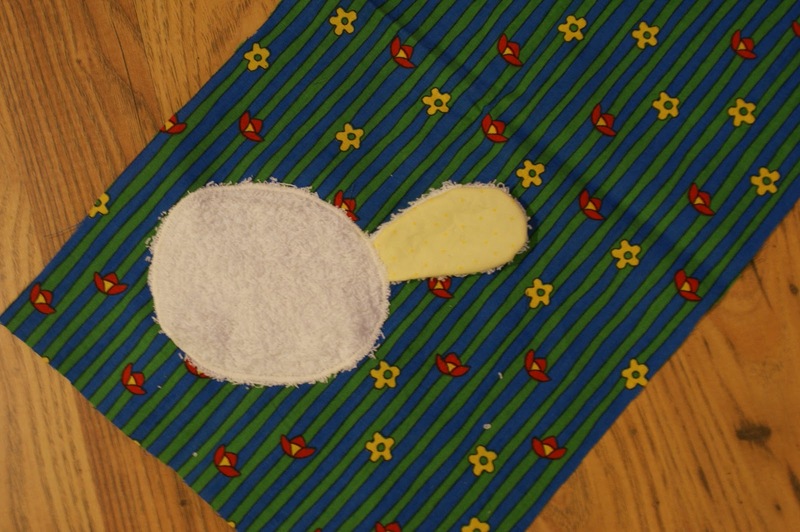 I made an Easter basket from a card paper. It's very easy project and can be completed in a very short time. Keep checking my blog to see this project as well as some cute and colourful Easter cards that I will post on my blog in the coming days/weeks. 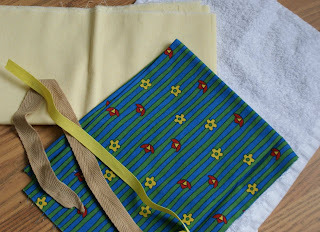 If you have already some sewing experience, you will find this sewing project very quick and easy. You do not need a lot of materials for this Easter bag and you can use any scrap material leftovers you have. The more colourful the bag the better. After all, it is an Easter time and a spring and it is nice to see a bit of colour after the grayness of the winter time. 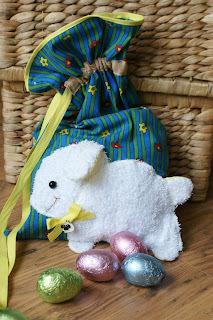 Let's make the Easter bag. 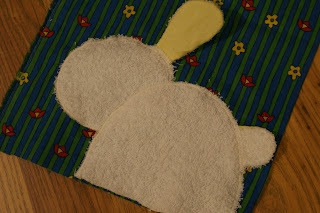 Cut 2 pieces of size 40 x 25 cm for the bag. The next step is to sew the sheep on to one of the 40 x 25cm main pieces. 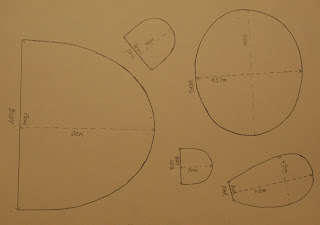 Cut 2 x legs, 1 x tale and 1 x ear from the yellow material (this will be the inside backing to create a colour contrast). When cutting, add a bit extra for the edge allowance for legs, tail and ear. 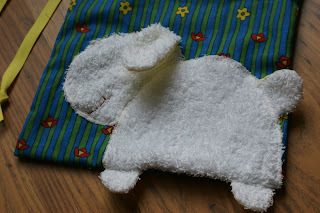 Then cut the body and the head from a white material - that material will be between the white towel cloth and the main piece bag material and you will not see it on the end product, but I had to ad this backing as the bag material is too dark and I wanted to ensure that the sheep's body will be pure white and the colour of the bag does not show through the white towel material. 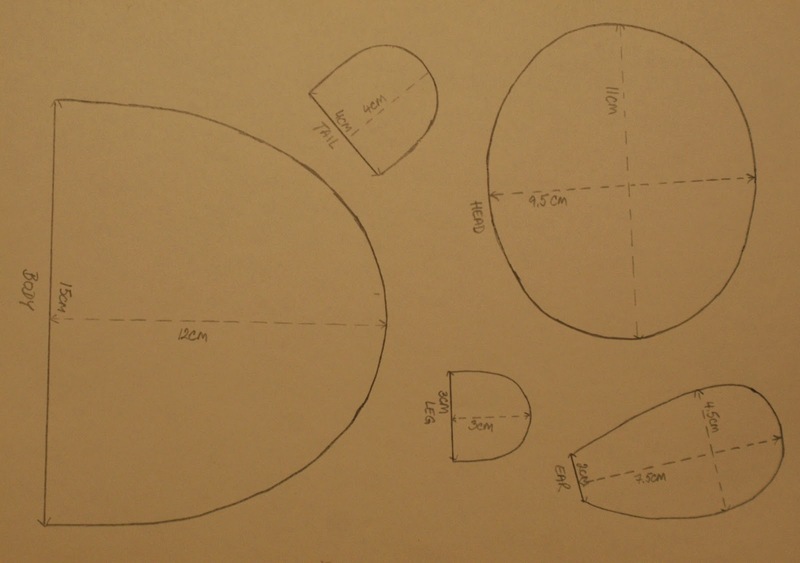 When cutting the body and the head, cut exactly as outlined on the template without adding any extra allowance as there is no need for an edge allowance. See picture bellow. 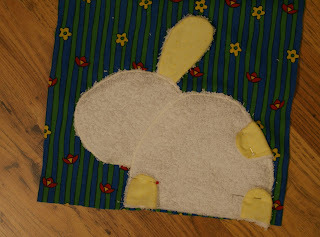 Secure all the cut pieces (legs, tail, ear, head and the body) on to the white towel cloth using pins and cut around. 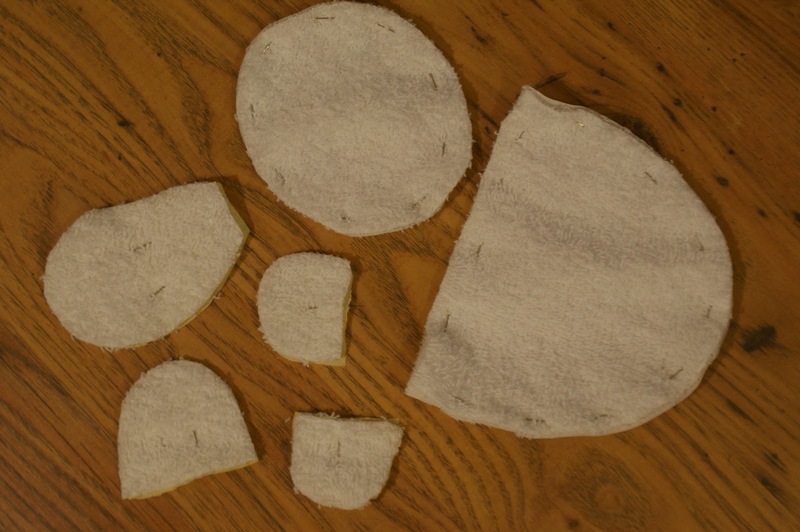 Make sure that the materials for legs, ear and tail are the right side together. Sew these alongside the template outline (leave the bottom of these 4 pieces unstitched) and then turn inside out. Take the head cut out piece and secure it with pins to the main bag piece (the white backing material is inside - between the towel cloth and the main bag material). Insert the ear underneath the head so that the head is overlapping the edge of the ear. 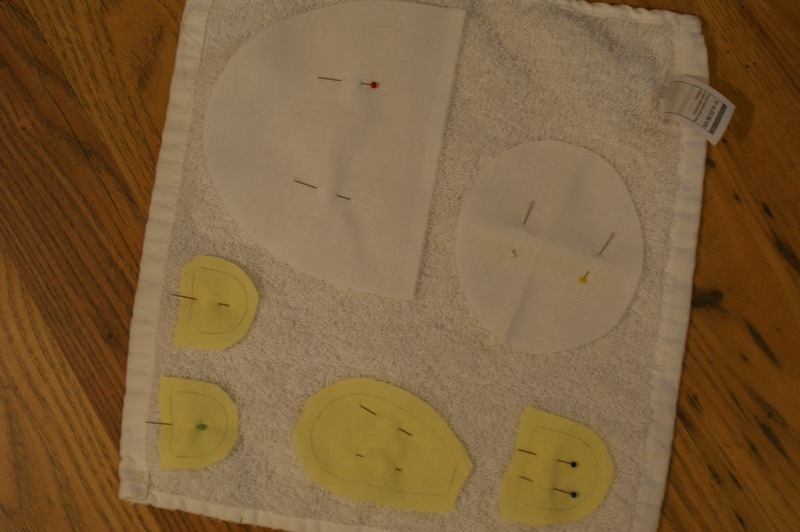 Then sew around the edge of the head piece. 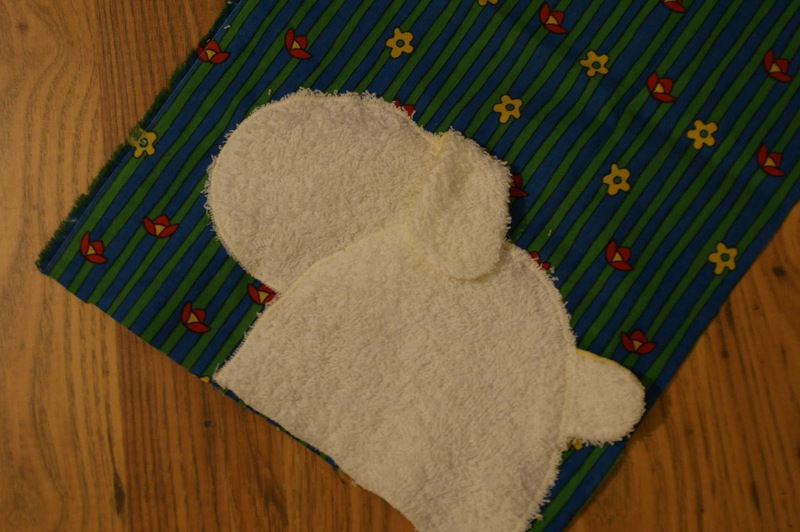 Take the body cut out piece and secure it with pins to the main bag piece so that it slightly overlaps the head already sewn to the bag (the white backing material is again inside - between the towel cloth and the main bag material). Insert the tail underneath the body so that the body is overlapping the edge of the tail. Then sew around the edge of the body. 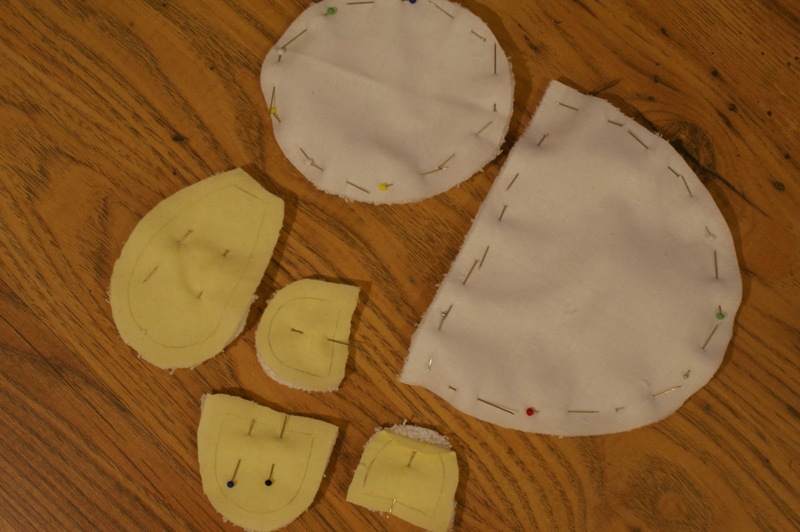 To attach the legs secure them to the body using pins as seen on the picture bellow. 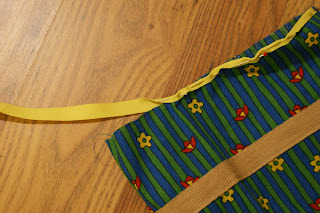 To ensure that you do not sew through the tail when sewing the sides of the bag together, turn the tail onto the body and secure it with the pin to keep it out of the way. Then take the other main piece (40 x 25 cm) and secure it with the pins to the other piece with the sheep sewn on. 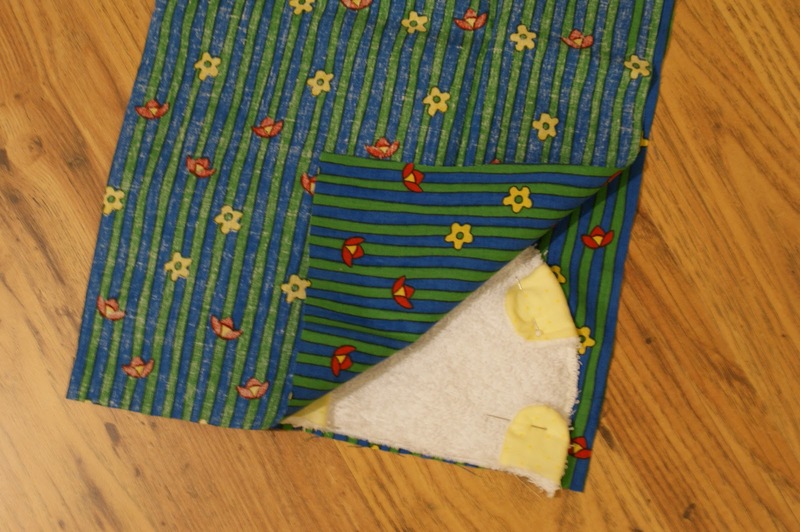 Ensure that the right sides are together and sew (right side, bottom of the bag - thus sewing through the legs and the bottom edge of the body, and then the left side of the bag) taking 1 cm allowance. Turn the bag through. Sew the beige rufflette piece onto the bag as close to both of its edges as possible, leaving an opening for the string on one side. Then pull the yellow rufflette string (apprx 100 cm ) through. Then take the remaining piece of the yellow rufflette and sew it onto the top edge of the bag. See picture bellow. And now those finishing touches. 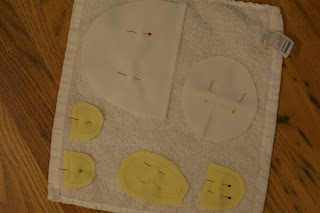 Sew a black bead (or a button) on as an eye. 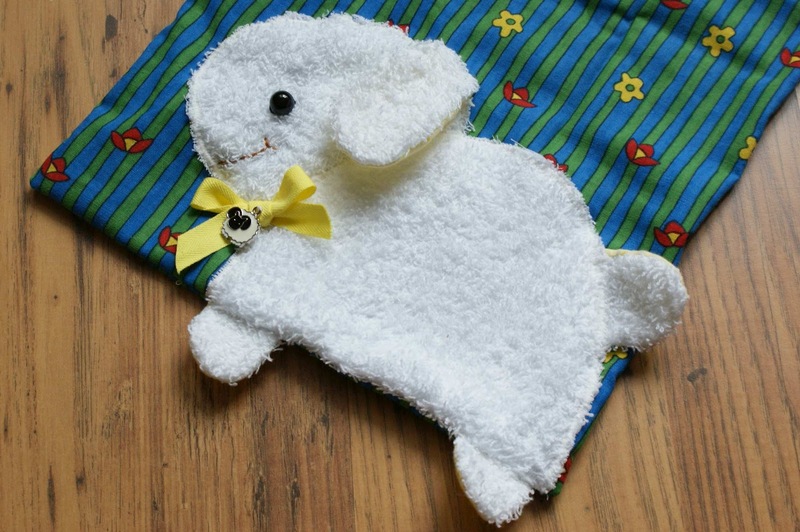 Tie a bow from the yellow rufflette and sew it onto the sheep. You can ad a small charm or a bell onto the bow. I have set up and online shop - CRAFT MAGIC ONLINE SHOP- on my blog (top right corner). You can now purchase many crafting supplies right here. The shop is powered by Amazon, so you would be making the purchase through Amazon. I have just selected (and sorted into various categories) crafting products that Amazon sells. 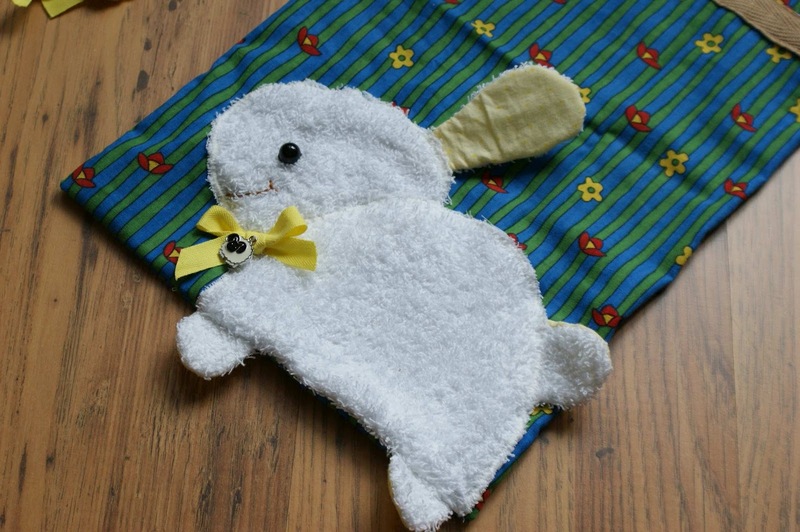 My blog's shop is divided into 3 parts; paper and scrapbooking supplies, crafty kids (offering variety of beautiful crafty kits and products designed for children) and sewing and patchwork supplies. 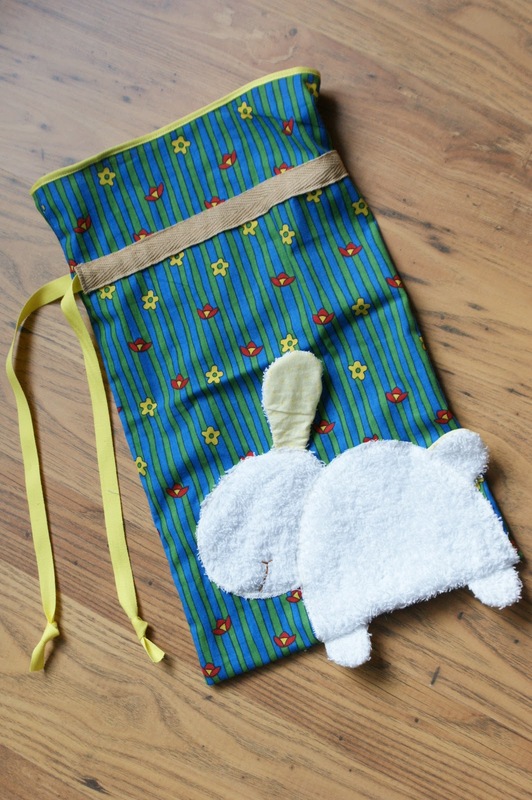 You can purchase following items in my online shop. Click on the image for more detail. The link will get you directly into my shop. Please note, that the stock has been available at the time of this posting and might be sold out in the future date.